Go Jump Off a Cliff! We recently traveled to Jamaica, where we had a chance to visit a couple of natural water falls and with the help of local guide, climb up the falls and climb through a cave and jump off a cliff! 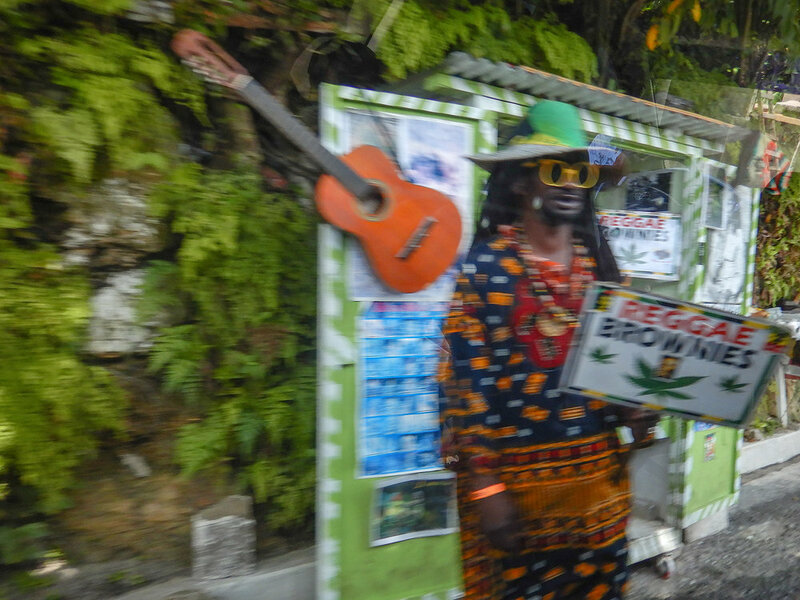 We had the opportunity to visit Blue Hole (Island Gully Falls) and Dunn's River Falls near Ochos Rios. You can travel to both places on your own and pay your admission, where you will be assigned a guide to lead you through the falls experiences. We did a full day tour with a private guide from Courtney Taylor Tours who arranged a full day experience with transportation, and a stop for lunch. Our guide, Kim, was young and enthusiastic, giving us lots of insight into the culture, language and local landscape during our trips to the falls. Our driver, Joseph was safe and clear eyed, and the van was comfortable and well air conditioned. Courtney Taylor Tours was easy to work with ahead of our trip, to customize details and answered emails promptly. Working with them allowed us to relax and enjoy the ride, learn a little about Jamaica and navigate around Jamaica safely and comfortably! Just a short time ago, this attraction was little more than a spot in the woods where guides would bring their guests. Today, it's bit more developed, a team of local guides take a small group out into the falls to experience a progressive sets of jumps, a watery natural cave, and a rope swing. The guides are great and take lots of photos with your own camera. There are areas for folks who don't want to jump to watch their family members. The guides also put on shows jumping from "guide only" locations, and showboating with flips. If you'd like a falls experience that still feels a bit "wild" and natural, Blue Hole is a good choice. Dunn's River Falls is very popular and has a very well developed park with lots of amenities and services. This a great choice for families with mixed interests. Those who want to climb the falls can while Grandma watches the small children in the splash park or wander in the gardens. Everyone can enjoy the restaurant and shops and there is a professional videographer documenting your tour! Although the photos we captured show the falls without people, this was due to some careful photography...in reality, expect dozens of people walking walking daisy chain style, up the falls. Although you can buy water shoes for about $10, you are much better off bringing your own amphibious sandals or sneakers, which have better traction. Wear your bathing suit, and choose one that "adheres" well to you...think sporty bikini, not string bikini, unless you like wardrobe malfunctions and starring in viral Youtube videos! Most ladies wore a skirt or short type bathing suit bottom for better coverage! Layer your shorts and tee shirt over your suit for protection from the rocks. Several of us left the experience with a few little scrapes, having tee or better yet, surf shirt protects your arms and back from rock scrapes in the caves or if you slip. Pack a set of dry shorts and tee (don't forget your undies! Unless you like going commando, and then well, good for you!) in a plastic bag to change into before you go to your "dry activities" (Lunch or driving back to the ship) Put your wet bathing suit back in the plastic bag. Bring cash to pay for trinkets and tips, credit card for entrances to the falls and photos. Although you don't have to buy anything other than your entrance, the falls guides do expect tips and they can't exactly make change, so bring many small bills so you can spread the love around! I think a couple of bucks per person in your party is appreciated. We did $5 per guide for 2 of us. We left our Courtney guide, Kim a tip for her to share with the driver. $15-20 per person for the day seemed fair. Bring sunscreen and reapply regularly! Bring water and hydrate regularly! 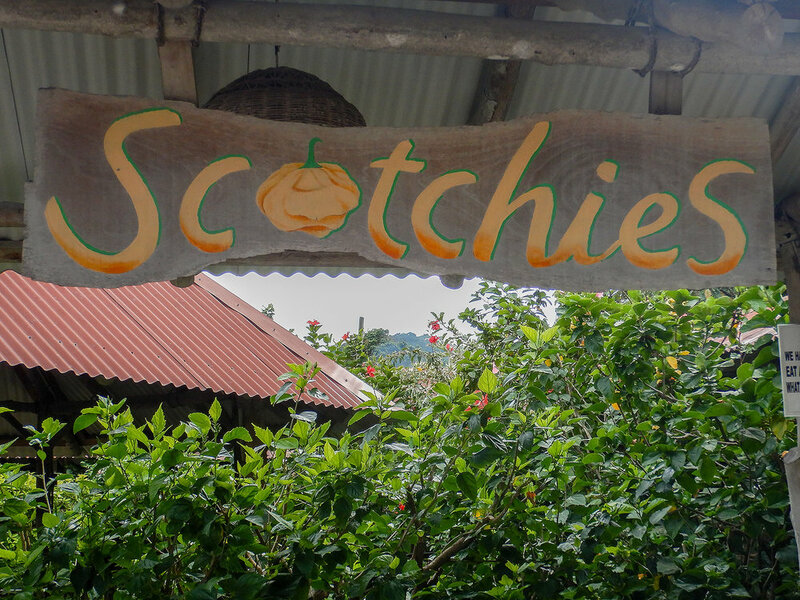 We enjoyed a nice Jamaican Jerk lunch at Scotchies, a local institution nearby. 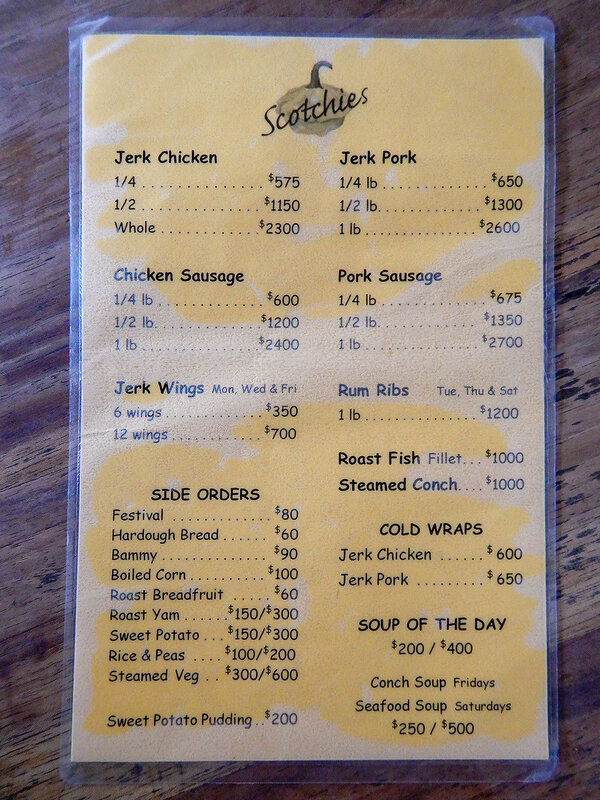 Half a Jamacian Jerk chicken, with a popular side dish called Festival- a deep fried dough!